3D GameLab is awesome. I can’t express that enough. This summer, I learned of the work some teachers were doing in gamification in a flipped classroom. That’s when I learned about 3D Game Lab. I recently moved out of the classroom and into an administrative role providing professional development for my staff. I was so disappointed that I couldn’t try 3D GameLab in my own classroom. In talking with Tom Driscoll, he suggested I use it for staff PD. Genius! I convinced my principal to get my school a subscription and began making quests. I was frustrated at first because the interface of 3D GameLab requires you as the user to complete certain quests in order to open up all the tools available to you. However, in the process, I was learning a lot about how to gamify a classroom and that will ultimately lead to a more successful implementation. After completing the necessary quests myself, I began creating quests. Most of my quests at this point have been introductions to the basics of certain tech tools. 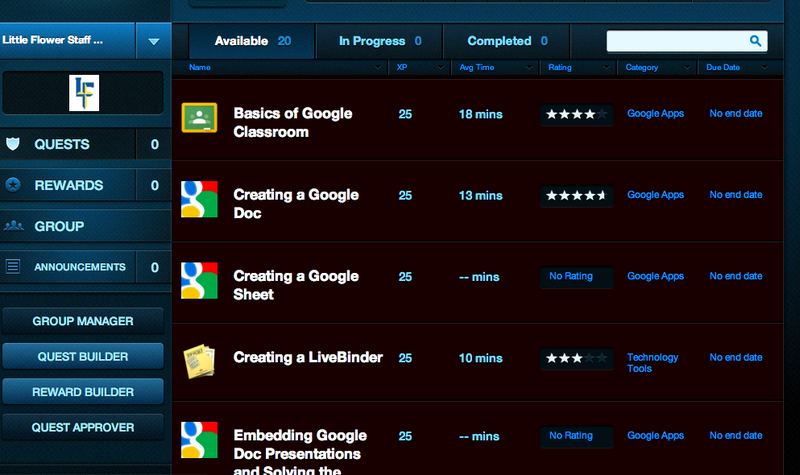 My school serious underuses Google Apps for Education, so I made several quests on using different GAFE products. Here’s a screen shot of a few of the quests I made available to my teachers. I introduced it last week at our staff meeting as well as emailed out instructions to sign up and join the class. It isn’t required participation, but encouraged. After the introduction, I waited with bated breath that afternoon to see who signed up. It was no one. Since I’m new to this school, I wasn’t sure what to expect for participation numbers. The staff seemed eager to learn, but I didn’t know how much effort they would put in. The whole next day went by and again no on joined. About 9:30 that evening, I got on my computer and I had an email. There was a quest that needed to be approved. I logged into 3D GameLab and I had 2 teachers that had completed 4 quests each. That was about an hour worth of work both had been doing. As I approved their quests, I noticed they were still completing other quests. Shortly after 10, they have completed 6 quests. Neither had any idea that the other one was on as well. More teachers began to join and out do each other on the leader board. One teacher signed in for the first time on Friday afternoon and completed 5 quests. I repeat, ON A FRIDAY AFTERNOON. Over the weekend, she went on to complete all 13 quests I had made available and was asking me this morning for more quests. She said when she got to 3 quests left she just figured she’d go ahead and complete them all. So far, I’ve been very pleased with the motivation of my staff to complete the quests. That is inherent in the gamified system, which is exactly why I wanted to try it out. So far, it has worked better than planned. A teacher that told me herself she was very anti-technology use because of her fears logged on and briefly was the point leader. She said she liked being able to work at her pace and not feel pressured to catch up to others. Would you prefer gamified PD?